He begins his new interpretation by pointing out that the destruction of Jerusalem by Titus in 70 AD did not fall within the first 483 years of Daniel's 490 year prophecy. Rather, it occurred 40 years after the close of that period. Thus, he surmises that the prophecy concerning the Temple's destruction most likely points to the last seven years of Daniel's prophecy — the period of the Tribulation when he believes the Temple will be destroyed by the Mahdi. So Richardson has gone from completely ignoring Daniel 9:26 to arguing that it was not the Romans who destroyed the Temple in 70 AD to now stating that the prophecy probably relates to a future destruction that is yet to occur during the Tribulation. I think what we have here is a perfect illustration of a desperate attempt to manipulate both Bible prophecy and Islamic prophecy to conform to a pre-conceived end time scenario. Even a cursory look at Daniel 9:26 reveals that the destruction of the Temple that it prophesies, occurs after the Messiah has been "cut off," that is, after the end of the first 483 years and before the beginning of the final Tribulation period of seven years. Another recent article by Richardson gloats over internal problems being experienced by the European Union. It was titled "EU Collapse: Doom for popular Bible prophesies? "51 Richardson observed: "Many staunch adherents to the Euro-centered end-time theory are slowly awakening to the possibility that soon there may not even be a European Union at all." He goes so far as to compare the prediction of an end-time revival of the Roman Empire to the Watchtower's proclamation that Jesus would return in 1975! I found this comparison to be downright ludicrous considering the fact that Jesus did not return in 1975 but the Roman Empire has been revived, as predicted, in the form of the European Union. Further, I found this attack to be amusing, because I consider the internal problems of the European Union to be a fulfillment of Bible prophecy. After all, what was the symbol of the revived Roman Empire in Nebuchadnezzar's dream? It was the feet mixed of iron and clay. Such a mixture is inherently unstable, and I have always interpreted it to mean that the revived Roman Empire of the end times would be a loose confederation of states before being galvanized into a powerful empire by the Antichrist. Rather than a great Muslim triumph under the leadership of a Muslim Antichrist, I believe the most likely end-time scenario for the Muslim world will be one of overwhelming defeat, first in the regional wars of Psalm 83 and Ezekiel 38 and then in the world wars of Revelation 6, 8 and 9. Muslim power in the Middle East will be dealt a terrible blow in the wars of Psalm 83 and Ezekiel 38, both of which I think will most likely occur before the beginning of the Tribulation. But the biggest portion of the Muslim world lives outside the Middle East. The largest Muslim nations today are Indonesia, Pakistan, India, and Bangladesh. It is these nations that I believe will offer the strongest resistance to the European Antichrist, and I believe they will be destroyed in the world war the Antichrist will launch, a war that begins as a conventional one in Revelation 6 but which appears to eventually morph into a nuclear one in Revelation 8 and 9, resulting in the destruction of one half's the earth's population. Overall, I think what Richardson and Shoebat are presenting as a possible end time scenario of events is a hodgepodge of ideas drawn from Bible prophecy, Islamic prophecy, and their own rich imaginations. What they present is not true to either Bible prophecy or Islamic prophecy. 49) Joel Richardson, "Daniel 9:26: Who Are the People of the Prince to Come?" www.joelstrumpet.com/?p=2440. 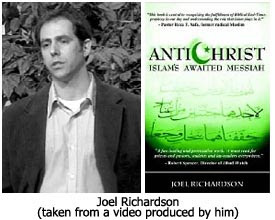 51) Joel Richardson, "EU Collapse: Doom for Popular Bible Prophesies?" www.wnd.com/index.php?fa=PAGE.view&pageId=160393. 52) Quote supplied by Lambert Dolphin (http://ldolphin.org). Hodgepodge, Hotchpotch, Flimflam, Mishmash, Codswallop, Balderdash, Twaddle, Claptrap,Tripe… is a Snozcumber! What point aren't you buying into? Yep, that did catch my eye, anony. I wouldn't go screaming blue murder, though. Pretribbers have been clobbered with worse observations. I read Richardson's book and the links in the reference (I encourage you to). Then I read Reagan's responses with footnotes (I encourage you to). I have serious doubts about Reagan's ability to do basic reading comprehension and even follow what Richarson has written. He simply ignores many claims, misrepresents others, and even makes stuff up! I expected more. Well, I'm sure Joel's a big guy and will deal with it on his blog. Personally, I side with the doc on Dan 9:26. But not because he said it. I looked up pre-wrath rapture and now understand. I thought it was pre-trib rapture but it is something entirely different. Reagan is old and cannot think right. He's also blinded by pride. He should retire and allow Nathan to run this ministry which will eventually collapse to the point when lamb and Lion will be no more. Dave is more concerned about protecting his little million dollar a year prophecy empire than presenting biblical facts. Yahweh is bigger and smarter than that. He is always trying to prove he is a "prophecy expert" when he is only repeating old reformation thinking. Too bad he does not have much longer to see time will prove him wrong. Are you aware your comment is prophetically charged? This attitude of disrespecting elders with a wealth of life experience and solid Bible teaching was prophesied by Jesus. Maybe the U.S. would not be in the state it is now had they not rejected the wisdom of an elder in favour of the arrogance of a flippity-gibbet with a mind empty enough to be successfully manipulated. Before you suggest it, no I do not put Nathan in that class. He knows what respect for one’s elders means and has the good grace to appreciate old fashioned, God inspired wisdom. Should the Lord tarry, you will be old like us one day, unless you experience the only other alternative. Thank you Dr.Reagan and Nathan for Lamb and Lion Ministry. I was lost in a sea of confusion. But now I am standing on solid ground.Thank you! Hmmmm.... I would have to say that Dr. Reagan is being quite dishonest here. I would challenge any of my fellow readers to read Richardon's response for themselves and decide if Reagan is avoiding the issue, if not purposefully trying to mislead his readers. Richardon cites some of the best scholars of Roman history in the world. And they all clearly disprove Reagan's claims. Do you stand with your boss and deny the Scriptural teaching that hell is forever? It seems to me and my study group that Reagan's denial of hell is a rejection of every Evangelical statement of faith on record. The Tribulation will end with the Second Coming of Jesus. The Antichrist and his False Prophet will be seized and thrown alive into the lake of fire, which is Hell (Revelation 19:20-21). At that point the activity of Satan will come to a temporary end. He will be held captive for the next thousand years while Jesus reigns over all the earth from Jerusalem (Revelation 20:1-3). The final rebels of history will be supernaturally destroyed by God when they march on Jerusalem (Revelation 20:9). At that point, Satan will be thrown into the lake of fire (Hell) where he will be tormented day and night FOREVER, together with his demons and the Antichrist and False Prophet (Revelation 20:10). Could it be that you and your 'study group' haven’t bothered to read Dr. Reagans articles properly? Have you confused the TEMPORARY release of Satan at the end of the 1000 yrs perchance? Dr. Reagan and Nathan both clearly state that HELL is FOREVER. Perhaps you have become afflicted with Joelitis, it does appear to be contagious? How long will the unrighteous be tormented in Hell? The traditional view holds that Hell is a place of eternal, conscious torment. According to this view, a person who winds up in Hell is doomed to a never-ending existence of excruciating pain and suffering. Hell is a place of no escape and no hope. Another point of view — the one I hold — takes the position that immortality is conditional, depending upon one's acceptance of Christ. I believe the Bible teaches the unrighteous will be resurrected, judged, punished in Hell for a period of time proportional to their sins, and then suffer destruction (the death of body and soul). I do not have Joelitis. I'm an Evangelical. And a Bearean one at that. I would encourage you to join me. Not only does Reagan reject every Evangelical Statement of faith on this issue, he even rejects The SBC statement of faith. Hell is eteranl and conscious. How Reagan can ignore verses that clearly says that the smoke of their Torment will ascend forever and ever is beyond me. Sorry bro, but I am way beyond hero worship. I'm going to stick with Jesus, the Word of God. All other ground is sinking sand! Then why did Jesus say do not fear man who can destroy the body but God who can destroy both body and soul in hell? Oh dear, you really are in a pickle aren’t you! Well as you’re a self professing ‘berean’, you can find out for yourself what you don’t know. Thankfully I am physically incapable of being a ‘Southern Baptist’ and if you are an example of its religiosity I wouldn’t touch it with a 10ft barge pole. While it is correct to ‘test’, you may also benefit by checking with Scripture exactly HOW you are required to do so. Do you also believe you do not need to be respectful, at least courteous, to an older person when you query? You are judging another of pride when your own haughty attitude has exposed a rather unpleasant demeanour. Carry on, oh pious one, you have a long fall coming to you, so it may as well be an extended one. I am not a Baptist. Reagan is. Now, first you denied that reagan rejects Evangelical doctrine and when i showed that he does, you say nothing. And you are accusing me of pride. Come on bro. And I didn't say anything about Reagan's age, just his bad doctrine and deceptive article. Thats someone else. The Lord is my Shepherd and Lamb and Lion Ministries is the only ministry that has helped and blessed me. I have departed from all others. Thank you Dr. Reagan and Nathan. It's kinda funny really, and even expected. Dr Reagan writes an article contra the Islamic AC and somehow his beliefs about hell get dragged in...once again. Joel and Walid came up with their own ideas and openly challenged the Roman AC theory. Now they're getting feedback and some people don't like it? There's a tiny violin playing somewhere. I think you have hit a 'bullseye'; its nowt but 'sour grapes'. I have seen NO written evidence to support the accusation that Dr. Reagan denies the existence of HELL. He say’s forever, surely he means means forever. Just like God will rule forever, without end. Hell was made for Satan in the first place, it will be like Groundhog day, on and on and on. "Another point of view — the one I hold — takes the position that immortality is conditional, depending upon one's acceptance of Christ. I believe the Bible teaches the unrighteous will be resurrected, judged, punished in Hell for a period of time proportional to their sins, and then suffer destruction." So I agree with you that hell is forever. As do all Bible-believing Christians. Reagan's teaching of a temporary hell is flatly rejected by every evangelical statement of faith that you will find. Check it against your own Church's statement of faith. Yeah, that's where I disagree with Dr. Reagan. I believe hell is forever (much as I wish his position was right, it just doesn't stand up). However, that doesn't discredit everything he's ever said. The point is that what Dr Reagan believes about hell is irrelevant to the subject of the Islamic AC in the article. If the article was about hell, it would be a different matter. Like EI said, "sour grapes". Talia and rg - well said and 'amen'. Well there’s a turn up for the books; you have been accusing Dr. Reagan as denying the existence of hell. That's an entirely different kettle of fish to what you claim as ‘anihilation’ (hardly) at the end of a period in hell. So what? Jesus will correct him, me, and you, when we stand before Him at the Bema. This sounds like a man with a tender heart who finds eternal torment for even the worst sinner too much to consider – at this time. It has no affect on another’s ability to be saved by Grace through faith in Christ Jesus. IF Dr. Reagan teaches as you say, then no, I don't agree, but I hope he is right, as I too find it a difficult handle to grasp. I see no purpose in slandering and persecuting Dr.Reagan and putting him on a par with J.W's; it’s self-rightous nonsense. Have you chosen to do this at the weekend for a reason, knowing Church activity is hindering them from answering for themselves? It smell's down right fishy to me, that you do not have the courage of your convictions to make yourself known, even by a non-du-plume,(however many you are) as it is a cause for confusion; and we all know who the father of that is, don’t we. You should concentrate on those who teach 'another gospel', adding works to the free gift of Salvation and adored by so called ‘Evangelicals’ and their many credos. No one is free from fault, not even you. If you think otherwise then you are fooling yourself's'. It would help immensely if y'all would sign up and pick a pen name on google, blogger, or what-where-ever so we know which "Anon" we are responding to... It's really not that hard, 'cause you "guys" are confusing me! PS. I said "guys" in quotes 'cause one of yous guys referred to EI as "brother". She has double-0 status, both of her hands and at least one of her footsies are registered as lethal weapons. Would you please ask your wife if'n you and er would give EI a cuddle now I am not a man again. I be an old bird, with plucked feathers from pecks and pokes that ave left EI a mite downcast. Hugs n blessings to yer both. Any trouble with the new firm, just let EI know and I'll send the Rooster over, tottin! Me arials good, Chicken Galore's on form, and the 12 bore un-broodied the hens who are now sitting on secret Tridents. OK then. Lot's of talk about Psalm 83, Hell, respect for the elderly and whether E.I./Sue is a woman (lol). Anyone have anything to say about the Muslim Antichrist Theory? To clear up some of the ad hominem pie throwing going on... Dr. Reagan is not a Baptist but is non-denominational, like the ministry. I'm currently a Southern Baptist, but have been a member of many other sound denominations. Dr. Reagan's view on the duration of Hell (that it exists isn't in debate), can be found in his article The Nature of Hell. See particularly under "The Example of Jesus." As for me, the duration matter is still food for thought, but a conditional length does seem to answer many questions concerning God's justice and Jesus' own teaching in Matt. 10:28. Thank you for the vote of no confidence that I'd run the ministry into the ground. As Yoda said, "There is another," but you'll have to wait till the next movie to find out who's taking over the reigns. I remain your humble and contented Web Minister. The destruction of Damascus in Isaiah 17:1-14 has to be coupled with Jeremiah 49:23-27, and so it will be Israel doing the destroying (see The Prophetic End of Damascus and Update). I'm convinced the Antichrist will not be a Muslim for three primary reasons: 1) his religion will be something new - the worship of himself, 2) Islam will be scuttled before the Tribulation by Ezekiel 38-39 which is not Armageddon (see Is Ezekiel 38-39 Armageddon? ), and 3) it was clearly the Romans who fulfilled destroying the Temple (Dan. 9:26-27). The unstated point of the article is who the Antichrist is is moot to us because of a Pre-Trib Rapture. We won't know anything about him until our return with Christ. It's only for scholarly reasons one even looks into his origins. No need to break fellowship over such an unimportant and trivial topic. I have a question. From time to time, I have accidently 'blown up' the blog and it enabled me to see all the text at once. Do you know how I can do it on purpose, I just don't know how? Sue, you can use the the magnify feature on the browser (View - Zoom). Internet Explorer's shortcut is on the bottom, right-hand side. Holding the CTRL key while running the mouse wheel will give the same result. Joel Richardson's followers are post-trib. For some reason post-tribbers are hostile. I don't understand it, but that is my experience with people of that point of view. I personally don't understand those that would come to a website they disagree so much with. I started reading Joel's website several years ago, but when I found out the major differences in his thoughts on prophecy I stopped visiting altogether. Also, love the Yoda reference! You hit the nail on the head, Gideon, concerning why the Muslim Antichrist camp is so energetic about this topic. Most hold a Post-Trib Rapture view and see Ezekiel 38-39 as Armageddon, so believe both the Church and Islam will be part of the Tribulation. They believe we have to be ready to identify the Antichrist or we'll be accidently deluded by him and take his Mark and so perish in Hell forever. This is a prime example of how one's end time view can so dramatically colors one's outlook about the future. Thanks for this brilliant site Nathan - fabulous resource, and it gives me hope for my Oz family. "Whoever believes in the Son has eternal life, but whoever rejects the Son will not see life, for God’s wrath remains on them." Doesn't that say if you reject Jesus you will not have life? Doesn't that say if you reject Jesus you will experience death instead of life? "Very truly I tell you, the one who believes has eternal life." Doesn't that say you get eternal life only if you believe? Doesn't that say if you don't have eternal life you will perish? "so that, just as sin reigned in death, so also grace might reign through righteousness to bring eternal life through Jesus Christ our Lord." Doen't that say sin without redemption equals death, not eternal life? "For the wages of sin is death, but the gift of God is eternal life in [Or through] Christ Jesus our Lord." Doesn't that say if you sin without Christ you die and only those who believe get eternal life? Is eternal life for believers different than eternal life for unbelievers? If life is eternal whether in hell or on the new Earth then why does the Bible say over and over and over that eternal life is ONLY for believers in Christ? If you're position is correct then you should be able to explain/answer this. Is EI British? Yes, for she once included "y-fronts" in a comment in which I replied "Mr. Humphries, are you free?" and she correctly responded "I'm free!" Is EI a woman? Well, if she answers her phone "The (enter her last name here) residence, lady of the house speaking" then I'd say yes. Is EI a woman? Well, if she answers her phone "The Bouquet(Bucket) residence, lady of the house speaking" then I'd say yes. "For some reason post-tribbers are hostile." Not just the posties, Gideon. I've visited other sites to try to understand their systems. You'll often see all sorts of criticism of pre-Trib. But question their belief structures and they get their noses out of joint. So we as evil beings still have the capacity to know right from wrong and choose to do good. Therefore, would we also not have the same capacity in our human justice system? Do you agree there are degrees of severity in regards to law? And therefore degrees of punishment for those who break those laws? Let's say one man who steals a loaf of bread to feed his starving children then another man murders those same children to steal that same loaf of bread. Would you, as a fallen, evil, sinful person give both of those men the same sentence? Or would your sense of justice demand a different outcome? We fallen, sinful people would still punish both men but the sentences would be vastly different. Don't you agree? Now ask yourself how God would deal with that situation when these men face Him in the afterlife for judgement. If either man were covered by the blood of Christ would he be pardoned (assuming the murderer became a believer after his crime)? If either man were not covered by the blood of Christ, would the punishment then fit the crime? Would the bread stealer and the murderer both be sentenced to the same torment and ultimate outcome? I suppose that is it in a nutshell for me. Again, at this time I honestly couldn't claim to know for sure myself. But wouldn't you agree there ARE good arguments on both sides at least? How's this - Those who accept Christ move from death to life and have a Eternal reborn spirit. When they are resurrected, it will be in an eternal body with an eternal spirit. We are all born with a dead spirit (which is separation from God). So when unbelievers are resurrected with their eternal bodies, their spirit remains dead, still cut off from God.? We tend to think God would be like us, yet even more merciful. Yet God's ways are not our ways and He is totally Just. Just trying to think it through. Sue said "We tend to think God would be like us, yet even more merciful. Yet God's ways are not our ways and He is totally Just." You hit the nail on the head. Thanks. THAT is why I can't come to a conclusion. I lean towards eternal hell but I can't get past can the thought of does anything (other than the devil, the false prophet and those who accept the mark of beast) really warrrant eternal (that is a HUGE word - FOREVER) torment? I guess I'll just have to wait until the next life to know for certain. What is the joke about "Bucket" anyway that you Brits get that we Yanks don't? I ask because in a AYBS episode one of the female cleaners says to Capt. Peacock "buckets" as a rude(?) reply. One slight little distinction that you are missing: 9x out of 10 in the Bible when life is mentioned, especially in the NT, it is referring to eternal life and life is NEVER associated with the lost. Life and death are never viewed as "existing" and then ceasing to exist, but rather in or out of communion/relationship with Life Himself. Adam and Eve did not cease to exist, but instead, were instantly separated spiritually, ie. communion/relationship-wise with the source of Life, and their bodies began to die as the body cannot sustain itself eternally, being separated from "Life" [God]. Isnt pronouncing bucket that way a dig at the french? PS. As you can tell, I disagree with Dr.Reagan on the duration of hell for the lost, and I believe that the level of torment is directly proportional to the revealed, depth of heart hatred of His righteousness and holiness. DrNofog, I'm surprised at you concerning your use of Rev. 22:11. Context, context. The reading is back in John's present. I see Rev. 22:11-15 as still addressing the eternal state of Rev. 21 and 22:1-7, with vs 8-10 as John's reaction while still in the heavenly future vision. How could the vile continue to act vile all alone burning in Hell? Can the righteous and holy cease continuing to be righteous and holy in Heaven? Jesus is clearly addressing the Church from John's time to the here and now. Wrong Nathan, the Book of Revelation is presented in past, present, and future. Write the things which thou has seen, and the things which are, and the things which shall be hereafter-Revelation 1:19. The 1st Chapter of Revelation identifies with the past, the 2nd and 3rd Chapter with the present and finally Chapter 4 through the 22nd Chapter with the future. After this I looked, and, behold, a door was opened in heaven; and the first voice which I heard was as it were of a trumpet talking with me; which said, Come up hither, and I will show the things which must be hereafter-Revelation 4:1. Therefore we can conclude without a doubt from Chapter 4 forward until the final Chapter being 22, the vision is for the future. The particular context of this ties into that of those that will fall under the strong delustion poured out upon the inhabitants of the earth during the time of wrath. And for this cause God shall send them strong delustion, that they should believe a lie: That they might be damned who believed not the truth, but had pleasure in unrighteousness-2 Thessalonians 2:11-12. So Rodney, you're saying in the eternal state Jesus then addresses the Tribulation age? Really?! And, DrNofog, if it is the eternal state, why in verse 17 is salvation being offered? And both of you, how can anyone add anything to the scroll John just wrote in verse 18 if human history is over? No, this is the epilogue - "a speech, usually in verse, delivered by one of the actors after the conclusion of a play." It exists to remind the audience of now what the play was trying to teach. I'm afraid you have to go elsewhere to find support for the eternality of suffering for everyone beyond Satan, the demons, Antichrist, and the False Prophet in Hell, Gentlemen. Bouquet vs Bucket. Hyacinth is a pretentious snob and she has ideas above her station in life. Her husband’s rather ordinary surname of Bucket is an affront to her; so she likes to pronounce it as the French bouquet (of flowers). It’s like my married name of ‘Jakeway’ and pretending it is ‘Jacquewei’. If you notice Hyacinth has polished up her ‘posh’ accent as she doesn’t sound like her two sisters. She has come from the same ‘working class’ background, but through her husband’s career (salaried rather than wage) she has ascended to the ‘lower middle class’ and likes to think she acts accordingly. Her expensive ‘Royal Doulton’ china is used every day, not just for ‘best’. Hyacinth goes to Church to be ‘seen and with’ the ‘proper’ crowd rather than genuine worship. Saying ‘buckets’ (to you) is akin to a polite alluding to a swear word without actually saying it. When the cleaner said ‘Bucket’s’ (but it could be anything) the standard reply is to say ‘And the same to you with knobs on’. There are lots of cheeky variations with our rather ‘Postcard’ humour – naughty but nice? We seem to have a love hate relationship with the French language. Folk trying to be posh will express themselves using a French phrase – like Miss Piggy who say’s ‘Moi’? Then if we DO actually swear, we will excuse ourselves by saying “Pardon my French” or even worse ‘Pardon emoi’. Thankfully we have a way of bringing one another back down to earth if we get pretentious like Hyacinth Bucket. “Allo, Allo” is a good example of us laughing at ourselves – and others, the humour is ‘dry’ and it is heavy with innuendo I fear. U.S. humour is generally more ‘slap stick’; recently hubby and I watched ‘Home Alone’, and we fell about laughing like drains, even though we have seen it many times before. Glad to be of service – nearly said something about Mrs Slocombe’s cat; but thought better of it! Nathan, I did not identify this with the eternal state, I clearly identified it with the time of wrath. My point was that this was yet a portion of the vision that was yet future, yet you stated it was part of the vision of the present. Sorry, for the confusion. "How could the vile continue to act vile all alone burning in Hell?" Nathan, it's a condition of the heart... doesn't require anyone elses participation. Thanks, Sue, and pardon me all for the sidetrack on British humor, which I really love but understand not half of it. DrNofog, soon as I posted I thought, "Yep, someone will respond with that." I should have added the point that while true sin is a heart condition, I'd image most will spend eternity begging forgiveness and mercy, if they are there forever. After a million years or so of burning, even the suffering of someone who was as evil as Stalin might get me to soften and beg God's mercy to end the torment. Forever's a long time, and God's not Allah. Good thing God's merciful! Who but the British can keep up with the pace of British humor? Monty Python always left me in the dust. "Huh, what'd he just say?" Nathan said "After a million years or so of burning, even the suffering of someone who was as evil as Stalin might get me to soften and beg God's mercy to end the torment." I was thinking at one point "I hope God sheilds us from this eternal suffering because how could I stand it, especially if I knew a loved one was there forever" so I know where your coming from. It's those kind of thoughts that allow me to consider the "eternal" in the punishment is the death of the soul and not the torment. It is to your credit that you don't 'get' some of our humour. Not that it is all mucky or 'lavatorial' because it isn't. Its directed to the mind and what is already known. So unless you are in the 'know', it is near impossible to 'get'. Have to say 'Monty Python'is not my cup of tea because imo it isn't funny when it's cruel - I may 'snigger'a bit, but then feel guilty. Although I was up in arms over 'The Life of Brian' when it came out, I have realised it wasn't a 'send up' of Jesus at all. it was ridiculing how people will idolise the silliest of things. For ages I felt bad about laughing over them singing 'Always Look on the Brightside of Life' as they all hung on crosses. Yes, even now it sounds dreadful humour, but the point was Brian insisted he wasn't who the people thought he was. The humour is cruel, and it is typical I'm afraid. When there is the most awful disaster, the jokes come thick and fast; it isn't meant to mock the situation, it seems to be the way many Brits 'deal' with tragedy. e.g.someone died on the loo - really, really sad but the comeback to that is 'What a way to go' laughing, but still upset. See? "...most will spend eternity begging forgiveness and mercy, if they are there forever. But they won't. They will seeth with rage and hate forever. Do you see what you're doing now? What you "feel" is what you want to insert into the scriptures here! A number of years ago a bible scholar pointed out in Luke 16 that the rich man showed no remorse or repentance, but rather, he selfishly did not want the additional torment of guilt for leading his 5 brothers astray. Billy said... "I was thinking at one point "I hope God sheilds us from this eternal suffering because how could I stand it, especially if I knew a loved one was there forever" so I know where your coming from." Psalm 52:5-6 - "God shall likewise destroy thee for ever, he shall take thee away, and pluck thee out of thy dwelling place, and root thee out of the land of the living. Selah. 6 The righteous also shall see, and fear, and shall laugh at him"
Psalm 58:10 - "The righteous shall rejoice when he seeth the vengeance: he shall wash his feet in the blood of the wicked." Psalm 37:13 - "13 The LORD shall laugh at him: for he seeth that his day is coming." Psalm 2:4 - "4 He that sitteth in the heavens shall laugh: the LORD shall have them in derision." I think I mentioned that if they hate God eternally then God is, obviously, just in punishing them eternally, even though we cannot fathom such a thing now. Just thinking about the Hell issue and Eternal again. We are IN time, and God is OUT of time – Eternity isn’t a ‘long time’ at all, it is ‘no time’ so it is impossible for us to grasp the consequences about something we have no experience of? Dr NoFog said "But after we are one with God and He has fully opened our understanding to see these things in His light, we will not have any "loved ones" in hell as we will see them as the vile God-haters that they are and we will rejoice in their destruction"
Is this not in conflict with your other comment "our compassion is patterned after the image of God, in that He "is longsuffering toward us, not willing that any should perish, but that all should come to repentance." So we shouldn't want anyonet to go to hell but if they do we should rejoice over it. Again, I'm NOT saying you're wrong, I just don't know. Scripture most certainly does speak of a place of fire where wicked people will be “punished with everlasting destruction and shut out from the presence of the Lord” (2 Thess. 1:9). This is gehenna, a Greek word that the Gospel writers used in reference to what is elsewhere called “the lake of fire.” It is significant that not only wicked people will be destroyed there, but also “death and the grave” will be forever exterminated (see Rev. 20:12-15). The lake of fire is also called “the second death” (Rev. 21:8). What does that mean? God’s Word clearly states that the Lord Jesus Christ will raise from the dead everyone who has ever lived, and that “those who have done good will rise to live, and those who have done evil will rise to be condemned” (John 5:29). Pending that Adolph Hitler or Saddam Hussein had no “deathbed conversion,” they will one day face the Lord Jesus to account for their evil ways, and after that be cast into the lake of fire to be annihilated. They died once physically, and they will “die” again—forever out of existence. Do you think that those listening to Jesus speak of the wicked burning in gehenna thought he meant they would burn forever? Of course not, because they knew that the garbage they took to the city dump did not continue to exist in the fire without being consumed. Rather, it burned up, and was gone. Jesus used the word gehenna to illustrate that the wicked were like the garbage, refuse worthy only of destruction. The only reason the fire continued to burn was because the whole city kept throwing their garbage there. Likewise, when it has done its job, the lake of fire will be no more. Try as we may, until this corruption puts on in-corruption, we cannot hope to grasp the infinite. All we can do is go with what The Lord has chosen to show us and trust Him to get it absolutely right – no – that is a future time statement. It IS all absolutely right, from the foundations up! It is all finished, a completed work from outside of our ‘time domain’ as Chuck Missler likes to say. It is DONE in fathomless Eternity and beyond our ken.imho. Billy said... "Is this not in conflict with your other comment "our compassion is patterned..."
23 And others save with fear, pulling them out of the fire; hating even the garment spotted by the flesh." In heaven, God will wipe away our tears and we will rejoice when we see all evil and evil-doers contained and put away from us forever. "...forever out of existence"...That sortta sounds like JW "stuff". Last time I heard any Greek scholars on the word 'destruction' and 'destroy', it is never used with the connotation of "ceasing to exist", but rather, like a building that is burned or demolished, now a pile of rubble, unusable for its intended purpose but definitely still there. DrNoFog said ""...forever out of existence"...That sortta sounds like JW "stuff"." If that is true then thanks for the heads up. I don't want to be led astray from the truth (even if I'm having a hard time dealing with it). What is your take on the Bible saying God can kill body AND SOUL. Does this not say YES God can kill the soul therefore the sould COULD be killed in hell? If not, WHY was this even mentioned? That one's a tough one that I still ponder. Most of the talk in the Bible concerns the spirit as the real eternal "you" and the soul seems to be your mortal consciousness in this world. But apparently, I now have to be more cautious about which whatevers I concur with EI! Rather than taking advice from those who knew better, I had eventually learned thru the "school of hard knocks" that dares are to be taken with the utmost caution. Ah me, ah my, ~~~ ‘The School of Hard Knocks’ – I know it well, I have never managed to graduate. Like I always say - just because you don't think it's true, doesn't make it so. Walid's interpretation(which is just a renewal of how the first Church father's viewed the End Times) makes so much more sense than what we've been taught for only 50 years. God's work throught history is one of people groups. Abraham messed up. His offspring are Israel, Arabs and Spirit-filled Gentiles - basically the world. It makes so much logical sense that the end of history will deal with Israel fighting against Arabs. Jesus comes to the rescue along with the Spirit-filled Gentiles. History revolves around Israel so we would do well to remove our USA-centric and European-centric interpretations of the Bible. USA-centric and European-centric interpretations of the Bible? Is that some kind of hermeneutic we should avoid? Did the early Church fathers interpret 666 the same way Walid does, even prior to Islam’s origin? It appears to be more than an Arab-Israeli “End Times” conflict to me. As for the ‘early church fathers’, they were up to their eyeballs warding off Gnosticism and didn’t know if they were on their backsides or their elbows, poor dears. I can understand David Reagan's position that souls in hell may not be for eternity. Is there anyone out there who knows if there are different Greek or Hebrew meanings for the words "everlasting, eternal, forever"? The reason I ask, is because there are places in the OT where God speaks and says "forever" or "everlasting" but actually relates to a very long time and the time period DID actually come to an end. Also there are verses that state that the soul that sins shall die and be CUT OFF. Then there are different words for hell. One being a place of burning of bodies. Could it be that the bodies are burnt up and the souls cut off. When Jesus talks about the place of gnashing of teeth, is He referring to the Lake of Fire or the place where the rich man (employer of Lazarus) was in torment. The Rich man was in a temporary place - not the Lake of fire, because Lazarus was in a temporary heavenly place too whilst activities were still taking place on Earth. Could the place of gnashing of teeth be those who are out of fellowship with God because of sin? I mean if we deliberately backslide for a period of time we can also experience torment until we return back to God. In many of Jesus's parables, He was referring to His kingdom on Earth through the church age. The only place (as far as I can tell) which seems to be clearly talking of eternal torment is where it says "their worm will never die". However, is it so clear cut? Does that verse really mean? What does "worm" mean, in this context? The reason I raise these questions is because I wonder how heaven can be perfect if our Heavenly Father knows that souls are in permanent torment. The scriptures show us the nature of God. Doesn't it say that God takes no delight in the deaths of the unrighteous. God will know that they are suffering eternal torment. Wouldn't that concern our Father? I accept that those who reject Jesus cannot take part in the Glory of Heaven and that they therefore are cut off from that existence, but eternity in torment??? Is that really a just punishment to meet the crime? The one who sins should be punished for a period of time, but there is usually a time limit. Is eternity really fair? I accept that God is Sovereign and what He determines (we as mere mortals) we should not question. His ways and His thoughts are WAY beyond our understandings, BUT does the scriptures CLEARLY teach never ending torment? We should never take just one verse in scripture (re the reference to worm) to make a whole doctrine, because it may not mean what we think it means unless backed up by many other passages of scripture. I have to say that it troubles me immensely to think that those I know and love (like my father who died without Christ) will definitely suffer torment for eternity. Just think about it, NEVER ENDING, forever and ever in torment, without end. Is God really like that? The God of Love that I know, who does not want anybody to perish "it is not God's will that any should perish" surely would not condemn sinners (without Christ) to be tormented for the whole of eternity? He is a just and righteous God who exercises punishment and judgement, but it is usually limited to a relatively short period of time. Those who reject Jesus WILL be cut off from the life of Heaven, but suffering in hell for eternity? Maybe "everlasting" (in some cases) could be referring to the fact that once they die, they die, they do not reincarnate - death is period! So, I would value you Greek and Hebrew schollars looking into the original meanings of our English words to see if there is any possibility that (what I hope for) is correct. Good comments and good questions, Truth Seeker. Here's Dr. Reagan's complete article on the topic of the duration of Hell. This side of Heaven, we just can't be 100% sure of its duration. But, the righteous will live by faith, right? Just because you think you are right, doesn't make it so. Well, I came here to read about the Antichrist as Muslim controversy, lol, but the conversation somehow switched to hell & how long it lasts. On that note I will offer that there is a Christian set of individual believers spread about (ie, not a specific "church group") who believe in a temporary hell who are also universalists. (Not saying I agree as I don't really know for sure at this point, but it makes for interesting reading). If you google for "Bible Students Notebook" &/or Clyde Pilkington you should be able to find the info. Their famous question is, "Does ALL really mean ALL?" (ie, all the scriptures, & there are many more than I realized, that say God will save All of his creation before it's totally over). They propose that believers in this Grace Age are only the first fruits, but that all creation will be saved eventually but that some (the bad guys) will have to suffer in hell (harsh discipline) before they will "wake up & learn" & willingly bend the knee to Christ. So therein is their "temporary hell" opinion. 1. Where is there a scripture that anybody ever gets out of hell/lake of fire/second death? Such a hateful article. Just because you don't agree with the interpretation doesn't give you the right to speak so hatefully. It's an "interpretation". You don't have the answers either.